©ESI Photography. 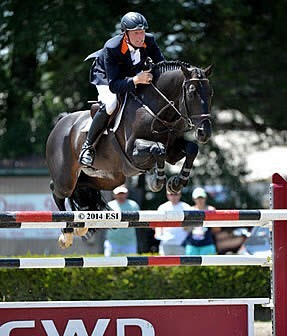 Peter Wylde topped the $40,000 Strongid® C 2X™ Grand Prix aboard Zorro. CULPEPER, VA (July 7, 2014) – Zorro’s loping stride wasn’t the typical jump-off variety in Sunday’s $40,000 Strongid® C 2X™ Grand Prix presented by Zoetis at HITS Culpeper. But he was deceptively fast, reuniting Peter Wylde of Lake Worth, Florida with Commonwealth Park in style. Two trips after Wylde, first in the order and first to go clean, hometown-Culpeper girl Brooke Kemper secured a jump-off with a fault-free effort aboard her own Classified. 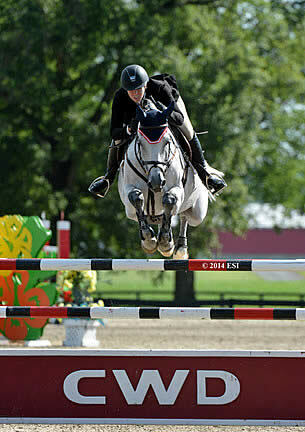 Harold Chopping of Southern Pines, North Carolina would later cap the jump-off in the irons of Basje for Kendra Bullington. In the second round, Wylde set an immediate Great American Time to Beat, stopping the clock at 46.06 seconds. Kemper returned determined to make Culpeper proud, but a rail came down at the second fence for four faults in 47.69 seconds. Chopping was confident he could match Wylde’s track and landed over the last fence clean before crossing the timers just six tenths of a second slower for a close second. Kemper held onto third, while Silvio Mazzoni of Reddick, Florida guided his own Remonta Habano to fourth, the only four-fault trip of the first round. Kama Godek of Fairfax Station, Virginia was the fastest of three eight-fault efforts over the original course to round out the top five. The Strongid® C 2X™ Grand Prix kicked off summer qualifying for the Zoetis $1 Million Grand Prix, which continues next week with the $40,000 Purina Animal Nutrition Grand Prix at HITS Culpeper. Habsburg 2’s barn name “Happy” was fitting to describe the disposition of his owner after the 10-year-old Dutch Warmblood gelding carried her to a HITS Culpeper win. Felicia Russell of Leesburg, Virginia just moved Habsburg 2 up from the Low Jumpers, but beginner’s luck was with him on Sunday. 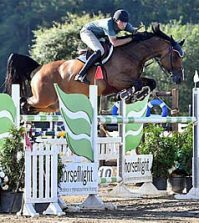 They topped a four-horse jump-off to win the $10,000 Junior/Amateur-Owner High Jumper Classic presented by Bayer’s Legend. “Considering this was our first High Classic together, I was thrilled with a double clear, let alone a win,” said Russell who has only just begun considering the Bayer’s Legend $250,000 Hunter Prix Final a real possibility. “I was sidelined with a broken collar bone over the winter, so we are just coming back, but if Happy keeps going like this, we may have to make a trip to Saugerties in September,” she added. Russell was first to best a big, technical 17 efforts in the first round before returning first in the jump-off. She laid down an immediate time to beat at 46.97 seconds, which became irrelevant as her three contenders all clipped rails. 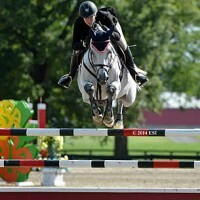 Sarah Hubbard of Cornwall, Connecticut posted the only four-fault trip in the jump-off, landing her own Athina Z the second-place prize. Tamara Morse of Bristow, Virginia was the fastest eight-fault ride aboard her own Heads Up 3E for third, while Sandra Zimmerli of Fairfax Station Virginia jumped to fourth in the irons of her own Apollo Mission. 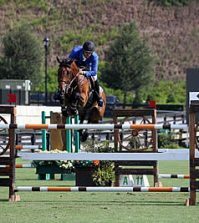 Andrea Torres Guerreiro of Waterford, Virginia rounded out the top five with Victoria for Santa Catalina Farm as the fastest four-fault ride from the first round. Kama Godek not only celebrated Independence Day on Friday, but a nostalgic anniversary with her own Air Force One. 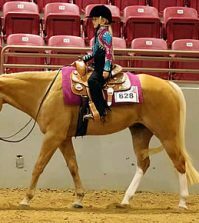 She and the 10-year-old Belgian Warmblood Gelding showed in their first class on U.S. soil exactly two years ago at HITS Culpeper. Godek was third to advance to the jump-off in a II.2.b format $15,000 Brook Ledge Open Jumper Prix. Three jumped against the clock after her, but her time stood at 35.46 seconds for the win. 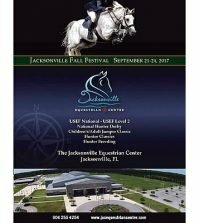 “The footing was perfect to jump on and starting the course with an oxer got us moving forward nicely,” she said. Peter Wylde rode Zorro to second and Manuel Torres of Leesburg, Virginia took third on Andrea Torres’ Cinderella. Ragan Roberts of Kennett Square, Pennsylvania was fourth in the irons of the Quipit Group’s Quipit L.F. and Sarah Hubbard of Cornwall, Connecticut rounded out the top five aboard her own Athina Z.
Brook Ledge Horse Transportation will continue to present a weekly jumper class throughout the HITS Culpeper summer and fall series. Aside from the winner’s purse, Brook Ledge Open Welcome riders also compete for the Brook Ledge Rider Bonus, which includes a $1,500 shipping credit for the rider who accumulates the most points in those classes throughout the circuit.